All golf courses are different. Some are easy to get around, while others can be a bit tricky. That is especially the case if you have a lot of equipment to carry with you! 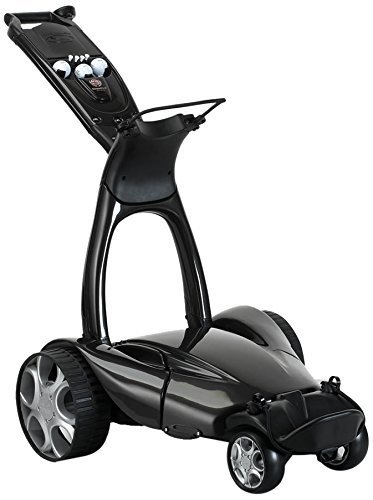 Many golfers are therefore looking for the best electric golf carts around to help make mobility from hole to hole that little bit smoother. Here’s our pick of the very best carts available for you to buy online right now. We start our electric push golf cart reviews with this nifty remote control cart. Boasting two motors running at 200W apiece, it is impressively powerful. It’s got a free-wheeling mode if you prefer to push by hand, too. As its name suggests, this model is a useful electric caddy. It comes with a directional remote to allow ease of control across all terrains. You can even make use of the downhill controls to harness your speed. Twin motors and a huge battery make for impressive on-course performance. The impressive-looking X3R is a winner with online reviewers. 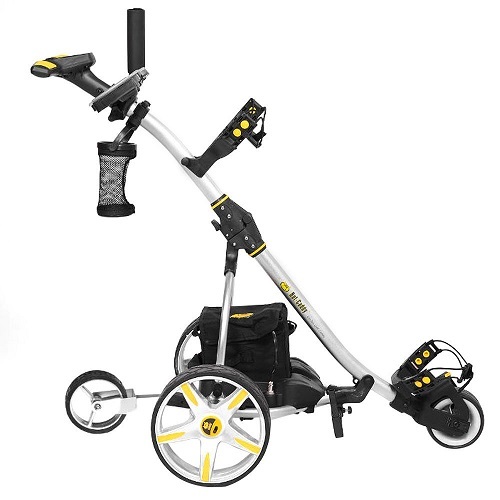 Cruise control functionality, dual motor functionality,and holders for cups, scorecards,and umbrellas help to make this a great all-around caddy. It’s nice and flexible. 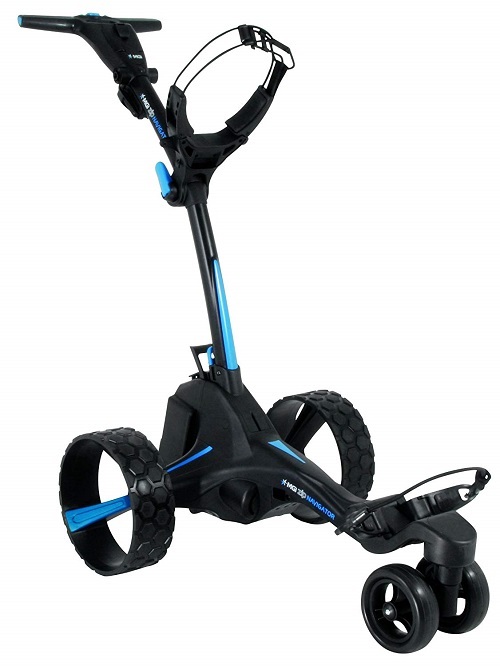 Of all the best electric golf carts we’re reviewing here, this one of the most futuristic. This smart caddy learns when to turn, when to stop and when to start. You can set it going to march right in front of you, too! It’s impressively adept. 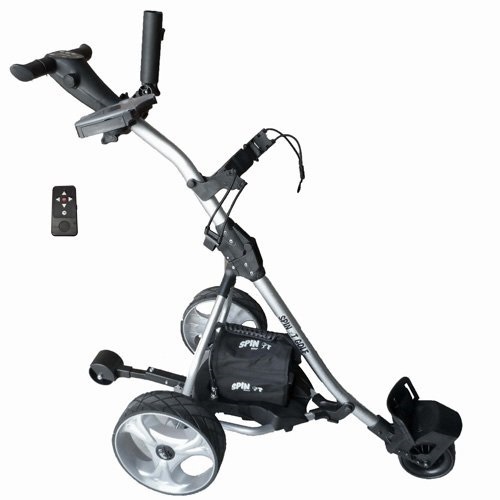 This cruise control cart works on two 200W motors and has an excellent rear wheel drive function. 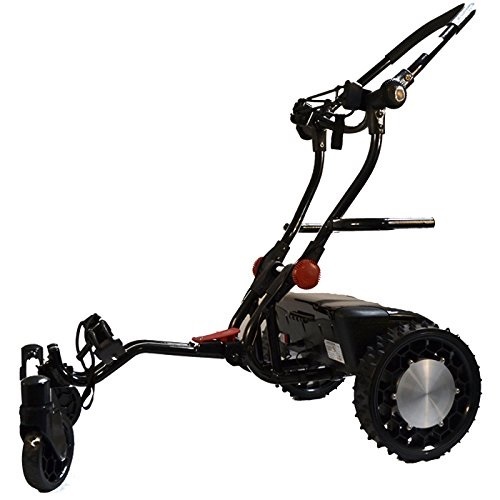 Unlike many carts, you can also free-wheel it with the power off. There’s plenty of holders and accessories built-in, too. It’s a good all-rounder for the price. 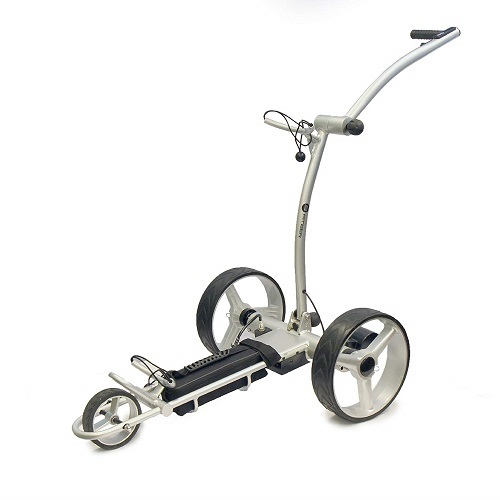 Spitzer’s streamlined trolley is a sturdy little cart with 4-direction control. The battery will last up to 27 holes of steady driving. You can also switch to free-wheel if you want to. 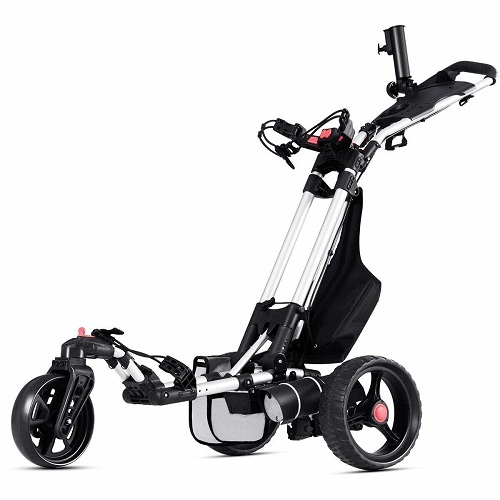 Of all our electric push golf cart reviews, this model is one of the more compact-looking. 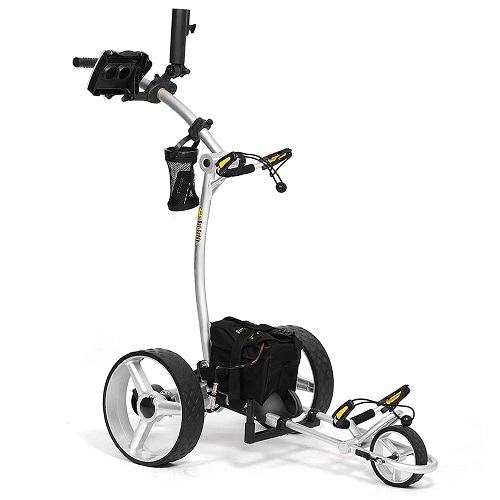 The Stewart Golf x9 is one of the best electric golf carts available from online retailers. It has Bluetooth technology to follow its users! 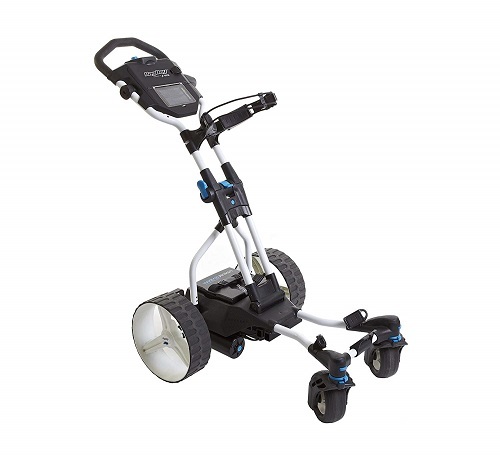 A rechargeable battery and multi-direction remote help to make this cart a follower you can rely on. This nifty-looking trolley comes stacked with accessories. Not only will it take you across 36 holes on one charge, but it’s also built with what’s marketed as ‘aviation-grade aluminum.’ That means it’s made to last. It folds up easily and has the right amount of power for the price. Simple name, simple cart? Of all our electric push golf cart reviews in this list, probably not. It looks the part with a digital display and has a built-in gyroscope to help stay on track when you need it to. It’s also got fantastic bag supports built-in. The last of our electric push golf cart reviews is for a model that’s quietly picking up praise. Designed to be super-sturdy and to tackle all terrain, Tangkula’s model is built with solid iron and is an asset for anyone with heavy bags. We hope you’ve enjoyed reading about the best electric golf carts online. For our money, the Bag Boy is sturdy and impressively capable, though the Bat Caddy models will also appeal to most golfers. 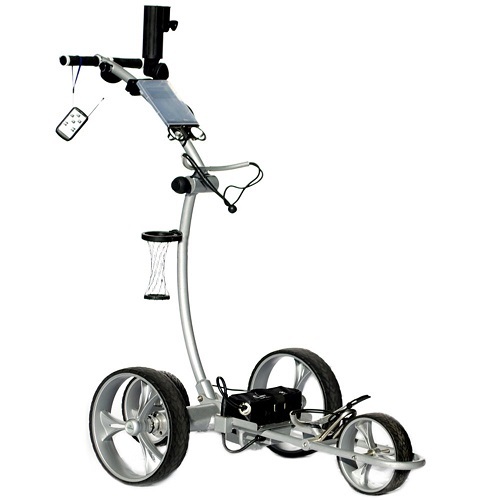 You’re going to need a golf cart you can rely on to carry all manner of bulky items and more! Why not take a closer look for yourself and compare? All are available now through Amazon and third-party sellers.